A Detroit actor is trying to set the record straight after promoting a flyer he claims he didn't know was fake. 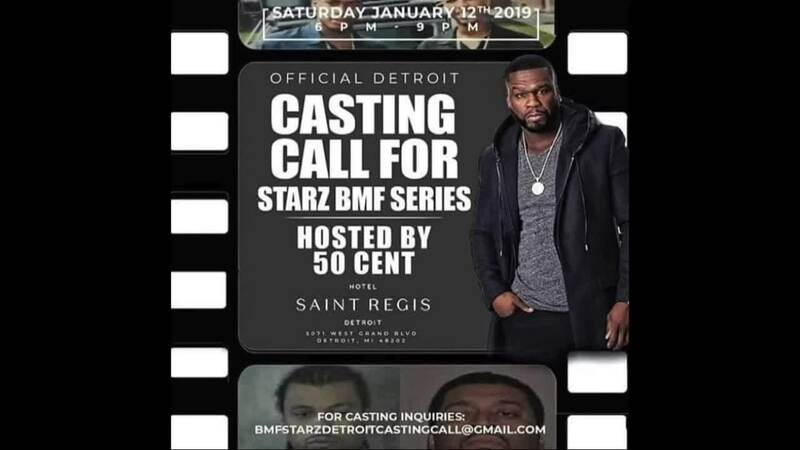 Terrence Ward was trying to get the attention of New York rap star turned actor 50 Cent by sharing a flyer saying the rapper would be hosting a January casting call in Detroit for a new show the Starz network. A Detroit actor is trying to set the record straight after promoting a flyer he claims he didn't know was fake. Terrence Ward was trying to get the attention of New York rap star turned actor 50 Cent by sharing a flyer saying the rapper would be hosting a January casting call in Detroit for a new show on the Starz network. Ward has previously worked on the set of television shows such as "Empire," "Chicago PD" and "Chicago Med." He says he found out about the flyer from a friend who tagged him in a Facebook post. The actor then posted the flyer on his Instagram page, tagging 50 Cent in hopes of getting a shot on the show. Less than an hour later, 50 Cent had shared a screenshot of Ward's post. What should have been excitement for the hungry actor, quickly turned shocking. Ward said people he knows said to him, "'Did you see what 50 Cent did? He screen-shotted your post, and he put some words on it, saying it was fake the s-word.'" Ward says that screenshot also included Ward's Instagram handle, so people thought he was the one behind the fake casting call flyer. Ward says thousands of people started trolling his page saying negative things about him. When asked what some of the worst things people said about him, Ward said comments included "I'm trying to use 50 Cent's name to get girls. Like this seems like some human trafficking stuff." Within a few hours, Ward says 50 Cent took down the post, but the troubling comments had already been made. "I just want people to know the truth," says Ward. The screenshot has since been shared in other places with his profile handle attached. Ward worries his more than a decade of hard work to grow in the entertainment industry is being tarnished. He now warns people to be careful of what they post. "Do your research, do your research." There's no word on who created the original post.